On 19th May 2010, Don’t Call Me Dave wrote what was supposed to be his final ever blogpost, in which he described Barnet’s greedy councillors as self-serving money-grabbing parasites. A number of senior Conservative Party members told DCMD privately that they thought his words were a bit harsh. Judging by a report in the Barnet Bugle yesterday, it seems that actually they were a gross understatement. Lynne Hillan is trying to force through a policy change which would see her allowance as leader of the council increase by nearly £20,000 from £34,909 to an obscene £54,227 - a rise of 55%. Other Cabinet members would see their allowances rise by almost 100% from £17,454.50 to £34,780. This is in addition to the basic allowance which will rise to £10,597. Eric Pickles, Secretary of State for Local Government, and Grant Shapps, Minister of State, have both said that in these austere times, councillors must not award themselves any increases in their allowances. Given that public sector workers have been told that their pay will be frozen for two years, this was not an unreasonable request. Lynne Hillan, however, has decided to stick two fingers up at senior members of the Government. Leaving aside the morality of her wanton greed, there is also a question as to the legality of the proposed changes because, as The Bugle reports, the papers announcing the increase were only published by the council yesterday, one day before the meeting. Local Government law requires three full days prior notice. But Lynne Hillan is not the only councillor to hit the jackpot. 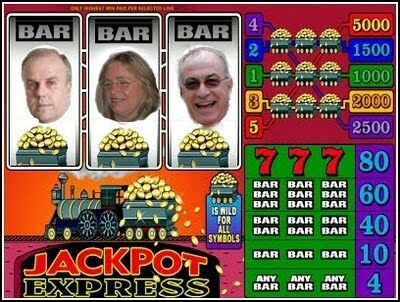 Last week, Rog T and Mr Toad both reported that shy and retiring Brian Coleman’s allowances were £113,735. This is a stonking increase from the paltry £102,965.50 he received in 2008/09. If Hillan’s proposals are passed tonight, Coleman will see his total pay packet rise yet again to more than £130,000 - a 27% increase in just two years. Other big winners are the husband and wife team of Andreas and Joanna Tambourgreedy who will see their combined taxpayer funded income rise from £56,000 to £70,500 - a massive hike of nearly 26%. Residents living in sheltered accommodation who are facing the loss of their warden service because Lynne Hillan wants to save money will no doubt be jumping for joy at this news. In addition to her council allowances, Hillan used to receive an allowance from the London Councils quango - as did former leader Mike Freer before her. Freer used to receive £10,248 for attending just one meeting a month until Hillan replaced him. After the elections in May, Labour took control of London Councils and, needless to say, awarded themselves all the best paid positions! Lynne Hillan no longer receives any allowance from them. No wonder she wants to push up her Barnet allowance to help make up for this terrible loss. Many people have contacted DCMD over the last two months to ask him to return to blogging and, indeed, there are still 200+ people a day who visit this site to read archived articles. Such attention is very flattering, but one of the frustrations and limitations of writing previously was the self imposed requirement to use moderate language when, more often than not, something stronger was justified. DCMD fears that if the ruling Tory cabal on Barnet Council votes through these unjustified and unjustifiable increases in their allowances, another vocabulary malfunction might ensue. Councillors must therefore throw out this report and return DCMD to peaceful hibernation. Thanks to Mr Toad for the picture. For God's Sake, Dave, START BLOGGING AGAIN. Welcome back DCMD: your borough needs you, please do the right thing and keep blogging. I promise not to faint if you use bad language. Someone has to keep an informed watch on these *****. On the other hand, one has to admire the creative approach and natural grubbing instinct they have for finding new ways of raking in the tax payers hard earned dosh. Now more than ever we need a blogger like you with your wide readership to get this out to the wider population. It is an utter disgrace coming just 10 weeks after the election. There can be absolutely no justification for this especially as councillors were happy to stand for election when the allowances were at the previous level. This is all about greed, pure and simple!